2. Sandbox Your Own Base (Test Self-defense). Just 4 steps and you can see traps and teslas and enemy troops as well in the Sandbox. 1. Turn on 【Sandbox attack】 and 【Sandbox from replay】. 2. 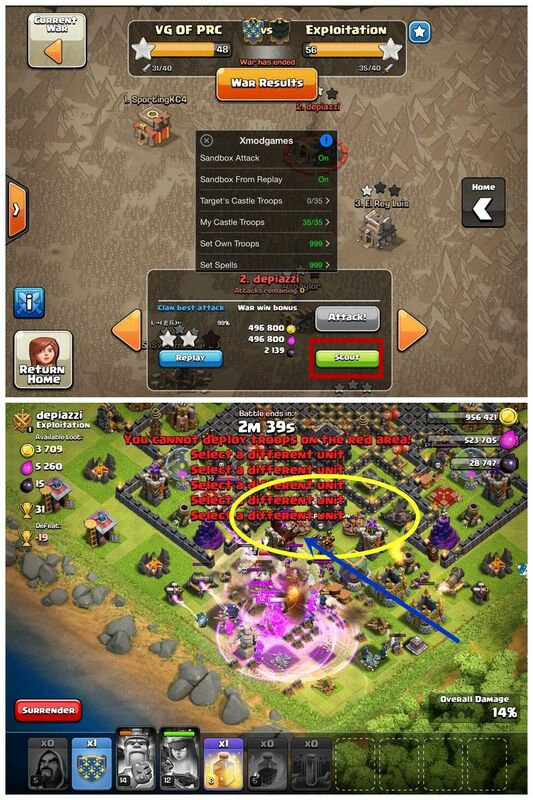 Go to clan war on BATTLE DAY or WAR RESULTS to look for enemy bases that has been attacked once with replay. 3. Watch the replay to get the trap data and then return. 4. Sandbox the same base. Enjoy! You can see Traps and enemy’s troops automatically now in Sandbox! 5.If you want to sandbox attack another base from replay,you must first watch the replay first! then repeat steps. ①Turn OFF Sandbox from Replay,if you want to simulate other bases. Or it will always be the last base you watch from the replay. E.g. you watch replay 1 and then replay 2. When you simulate with Sandbox from replay ON, it’s replay 2’s base. Every time you enter the visit or scout when Sandbox from replay is ON, the base is always the replay base. ②No Need to Set Enemy Castle Troop when Sandbox From Replay is on. There are three cases you will meet in Sandbox from replay. Since you have been donated the same troops, you don’t have to worry about it. 2.cc troop is not exactly the same. a.different number: Your clan castle’s housing space is too small. Upgrade it. b.different level of the same troop. You haven’t been donated this level of troop. Ask your clanmate to donate one. Or join a more active or powerful clan. 3.No troops. You haven’t been donated this type at all before. ③You can combine 【Sandbox from replay】 with 【Set My Own Troops】, 【Set Spells】 & 【Set My Castle Troops】. 【Set enemy troop】only works in normal Sandbox Attack. In clanwar, we suggest you invite your clanmates use XMG and cooperate with your clanmates. That is, ask your Chief to plan the attacks. 2. The first attack on each base is for replay’s sake. 2.Open Defense log and click replay. 4.Then “Visit” your rival or anyone else. The base being simulated should be your own base. Enjoy!